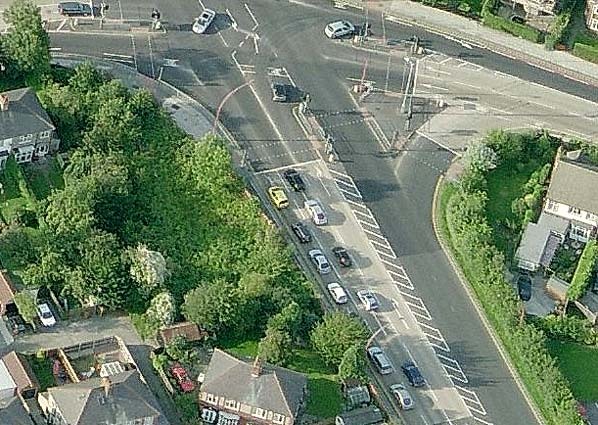 Location: South side of Weelsby Road (A46), Peakes Parkway (A16) now runs though the site. Notes: Weelsby Road was one of 6 halts opened by the Great Northern on 11th December 1905 prior to the introduction of a new railmotor service. It consisted of two short low platforms on the south side of Weelsby Road. A single storet signalbox to control the crossing was built on the down side of the line on the south side of the crossing. The crossing keeper's house, of similar design to others on the line was on the up side to the north of the crossing. In 1935/6 a subway was built to take the road under the railway and the level crossing was removed.. The East Lincolnshire Railway (ELR) was proposed as one of a group of allied railway bills during 1845 and 1846 as part of plans by the London York Railway (L & YR) to build a link between London and Leeds/York. over the Manchester Sheffield & Lincoln Railway into Grimsby Town station. Both the ELR and L & Y proposals received royal assent on 26 June 1846. Once the bill was passed by parliament, the London & York name was dropped and the title The Great Northern Railway (GNR) was adopted. Construction of the first 14 miles section of the double track line between Grimsby and Louth was rapid. Work started early in 1847 with contractors working 7 days a week despite disapproval from local churches and the press who condemned the company for working on Sundays. The first train for directors and VIP's ran on 17 September 1847, completing the journey in 20 minutes. The line opened for passenger traffic on 1 March 1848 with intermediate stations at Ludborough, North Thoresby, Holton-le-Clay with Tetney and Waltham for Humberstone. These four stations had staggered platforms either side of a level crossing. Although nominally independent, the line was leased to the GNR from the start. The middle section between Louth and Firsby opened on 3rd September 1848 with intermediate stations at Legbourne, Authorpe, Aby, Alford, Willoughby and Burgh. The final section south to Boston opened on 2nd October 1848. This was the first line to be operated by the GNR, their line between Peterborough and Lincoln (the Loop Line) not opening until 17th October 1848. In 1865 a new line linking Louth with Lincoln was proposed. The route would leave ELR at a junction facing Louth running roughly south west to a junction with the Lincolnshire loop east of Five Mile House station. The Louth and Lincoln Railway Company was incorporated on 6th August that year but within a few months it was clear the company would be unable to raise sufficient capital, and a revised route was then proposed joining the Loop Line at Bardney. By August 1873, 10 miles were completed between Bardney and South Willingham and after protracted negotiations with the GNR, the line opened for freight traffic between Bardney and South Willingham on 9th November 1874; this was extended to Donington-on-Bain on 27th September 1875 and finally through to Louth on 26th June 1876. A line from Louth to Mablethorpe was first proposed in 1864 running from the ELR at Alford to Mablethorpe, but despite obtaining an Act the company couldn’t raise sufficient capital. In 1871, the Louth and East Coast Railway was formed to build a line from Louth to Mablethorpe via Saltfleetby. The company received its Act on 18th July 1872 and the GNR agreed to work the line. Work started in September 1875 with the optimistic intention of opening in the summer of 1876. Progress was however slow and a second Act was obtained on 17th May 1877 to extend the time allowed to complete the line. The Louth & East Coast Railway opened on 16th October 1877. As well as holiday traffic to Mablethorpe, the line passed through rich grazing land which would also bring additional income with livestock being carried to Louth Cattle Market. Under the 1884 Harbour & Dock Act, the Sutton and Willoughby Railway Company was formed to build a line from the new Sutton Docks to Willoughby on the ELR in order to distribute locally caught fish to markets around the country. The S & WR had little trouble getting their Bill through Parliament on 28th July 1884.Work started at Willoughby in June 1885 and was completed in little more than a year. After protracted negotiations the GNR agreed to work the line which opened on 4th October 1886. The original 1848 station at Willoughby closed with a new station opening at the junction 132 yards to the north. On the 25th September an Act authorised the S & WR to extend their line to join the L & ECR at Mablethorpe. The 2 mile 47 chain extension took three months to complete, opening on the 14th July 1888. The development of Skegness as a holiday resort began with the coming of the East Lincolnshire Railway, buses taking passengers from Burgh station into Skegness. A branch line from the ELR to Skegness opened on 28th July 1873 with the majority of holiday traffic coming from the south. To attract visitors from the north of England a number of schemes were proposed to build a direct link between Lincoln and Skegness. In 1884 the Lincoln & Skegness Railway Bill was approved by the House of Commons but defeated in the Lords following opposition from the GNR who refused to work the line. Within a few years another Bill was put before Parliament, and on 16th September 1887 the Lincoln, Horncastle, Spilsby & East Coast Railway (HS&ECR) received authority to build a line from Stixwould on the Lincolnshire Loop Line. The company was unable to raise sufficient capital and the GNR declined an offer to take over the powers when the scheme was abandoned in 1891. On the 11th December 1905 a number of halts were opened prior to the introduction of a new railmotor service between Louth and Grimsby, these were Fotherby Halt. Utterby Halt, Grainsby Halt, Holton Village Halt, Weelsby Road Halt and Hainton Street Halt. The new service consisted of a small engine attached to a single coach, although at busy times additional coaches could be added. There were up to 8 return trips a day on this service. There were no further proposals for a northern route into Skegness until 1910 when Skegness Town Council approached the GNR asking for better service to the resort from Manchester, Birmingham and Leeds. It suggested a line linking the Spilsby & Horncastle branches stating that if the GNR was not sympathetic, they would seek help from the Midland Railway. An alternative scheme was also suggested, with a new line being built from Kirkstead on the Loop Line to Little Steeping on the ELR. The GNR Board approved the latter scheme and on the 18th July 1881 they were granted a light railway order. Although the new railway’s official title was ‘The Kirkstead and Little Steeping Railway’ it was universally known as the ‘New Line’. Construction of the 15-mile double track line started at both ends in March 1912. The line left the Loop Line at Coningsby junction south of Kirkstead station, joining the ELR at Bellwater Junction, between Eastville and Little Steeping. The new line opened for goods on 1st June and passengers on 1st July, 1913. In 1923 the Great Northern Railway became part of the London Northern Eastern Railway. During 1924 most of the Grimsby fish trains were routed on the ELR when it was realised that the line was less congested and the fish could arrive more quickly at its final destination. Between the wars local traffic on the line was in decline but the railmotor service between Louth and Grimsby was well used. Weelsby Road and Grainsby halts closed in 1940. In 1948 the line became part of British Railways following nationalisation, but with the increasing popularity of road transport there was soon talk of further closures. The Louth - Bardney line closed on 5th November 1951 and Louth - Mablethorpe closed on 5th December 1960 and the remaining . Holton-le-Clay between Louth and Grimsby closed on 4th July 1955 and the remaining stations on that section of line closed on 11th September 1961 with the exception of North Thoresby. At that time, the British Transport Commission stated that the Willoughby - Mablethorpe line would remain open with services developed if demand increased. However no attempt to develop holiday traffic was made; instead there was a deliberate ‘run down’ of railway services throughout East Lincolnshire with a reduction of cheap tickets and the withdrawal of services from time-tables. The Beeching Axe was about to fall. Woodhall Junction - Boston closed on 17th June 1963. British Railways also proposed closure of the Lincoln - Skegness line on 6th June 1964 and it was soon clear that the Boston - Grimsby line was also under threat. The Beeching Plan proposed the closure of virtually the whole of East Lincolnshire to railway traffic. Peterborough – Grimsby via Boston, Lincoln – Firsby via Bardney, Willoughby - Mablethorpe and the Skegness branch. The largest public enquiry held by the Transport Users' Consultative Committee (TUCC) took place at Skegness on 15/16th September 1964. By the time the public hearing took place BR were able to claim fewer passengers were likely to suffer hardship because people had been deterred from using the services by the reductions. After vigorous and often heated debate the committee concluded that the British Railways board should re-examine its proposals. This it did and in due course once again proposed closure, this time with the exception of the Skegness line. A second TUCC inquiry was held at Skegness in May 1968 and its decisions were again submitted to the Transport Minister who this time supported the Board’s proposals. during its short season there were insufficient regular users of the service during the rest of the year to justify retaining the service. Closure was announced for 5th October 1970 with the last train running two days earlier. The line south from Louth to Boston was closed completely from that date but the Grimsby to Louth section was downgraded to a freight only branch delivering grain to Associated British Maltsters in Louth. Three trains were scheduled each week but in reality trains ran 'when required'. In March 1978 a preservation society was formed to fight the final closure of the line. They compiled a petition and organised some rail tours in the hope that they could convince the government and British Rail that local people wanted the line. By 1980 there was very little traffic over the 14 mile branch and all traffic ceased that year; the last passenger train was a railtour organised by the Grimsby & Louth Railway Group on 2nd December 1980. After closure, British Rail quickly lifted the track and demolished all the buildings (except Louth itself which was listed) in order to deter the preservationists. The Grimsby-Louth Group became the Grimsby-Louth Railway Preservation Society a group of volunteers whose aim was to rebuild the line. The original aim was to restore the whole line from Grimsby to Louth. The society rehabilitated Ludborough station in 1984. Following a public enquiry in 1991 a Light Railway Order was granted to the Great Northern & East Lincolnshire Railway plc, which allowed them to develop the line. They bought the trackbed between Louth & Waltham from British Rail and started operating trains in 1991. The initial aim of reopening the line from Louth to Grimsby is no longer possible, due to the opening of a bypass on the track formation near Grimsby. However, it’s hoped eventually to reconstruct the 10 miles of track between Louth and Waltham. Ludborough has been restored as a working station; there is now a signal box, built in the original Great Northern style and a waiting room which houses a small museum and shop on the southbound platform. In 2008 the track was extended north into North Thoresby and the station was officially re-opened 26 August 2009. Track laying has now started south from Ludborough towards Utterby. The Lincolnshire Wolds Railway now operates a steam service throughout the year, mainly on Sundays with a Wednesday service throughout August. Willoughby 2nd, Burgh-le-Marsh & Firsby. 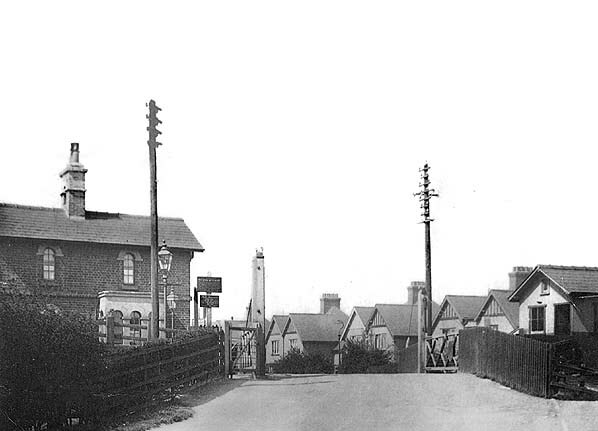 Looking east along Weelsby Road before 1936 when the crossing was replaced by taking the road under the railway. The halt was to the right, the station house is seen on the left, Everything in this picture has been demolished. The site of Weelsby Road Halt, now lost under Peakes Parkway (A16). The halt was to the south of the road junction, Weelsby Road running across the top of the picture.